Despite its unfortunate rejection by a list of misguided NYC publishers, Family Plots is getting rave reviews as a darkly comic autobiographical novel about a young mother trying against all odds to create a normal family life with her new husband, a criminal attorney, who–it turns out–is committing a few crimes of his own. 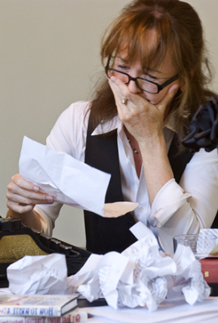 The book offers a wry, unsentimental account of a marriage barreling toward calamity. In an attempt to find romance, family, and financial stability, its struggling heroine stumbles into a world of pseudonyms, fake weddings, and hidden bank accounts. Events that land many of the players in the family cemetery plot also reveal unexpected secrets and stashes that manage, in small ways, to transform a tale of seeming tragedy into one of surprising healing and redemption. "Mary Patrick Kavanaugh tells her story with such unabashed honesty and rapier-sharp humor that she had me hooked from page one. This is one of those 'you couldn’t make this stuff up' kind of books that makes you think that’s awful, while you’re laughing out loud at the same time. But beneath the wonderful wit in this dark comedy is a layer of poignancy that takes my breath away. In the end, it’s about all the crazy things we do for love." "…[It] reads like a thriller. I honestly couldn't stop thinking about it all the time I was reading it, and finally just took the phone off the hook to finish it." 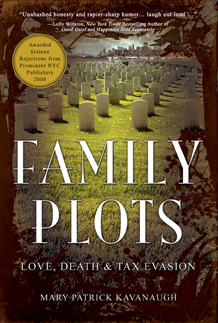 "…Family Plots has a great story at its heart: the tension between the longing for security and the longing for excitement, played out in the narrator’s romance in which she increasingly sacrifices steady judgment and middle-class dreams to the power of her attraction toward a man whose charm gives him away as a con man and a dreamer. In a subtle way, this story also makes an argument for a compassionate understanding of human imperfection and of the possibility of healing, in small ways, our sins against one another." "Ms. Kavanaugh is a talented writer with a fresh and unique voice…"
"The writing is refreshingly accessible and everything from the plot to the intriguing cast of characters kept me guessing (and laughing) throughout…"